We offer a 2 hour Gun Safety class (FREE with your $20 lane reservation. Our heated and air conditioned shooting ranges are custom-designed from decades of experience operating various range systems. We keep our store stocked with the latest products and firearm accessories. Our indoor shooting ranges exceed the industry standards for training and safety with professional instructors always on hand to ensure that every shooter has the knowledge they need. We stock all the latest in firearms and accessories. Whether you want to buy now, put something on layaway, or rent, we’ve got you covered. Range, Guns & Safe’s is Atlanta’s preferred facility for shooting range services, firearms, safes and firearm accessories. Our heated and air conditioned shooting ranges are custom-designed from decades of experience operating various range systems. Pick an item from a wide range of revolvers, carbines & handguns. All guns must go through an FFL and have to be picked up in store. 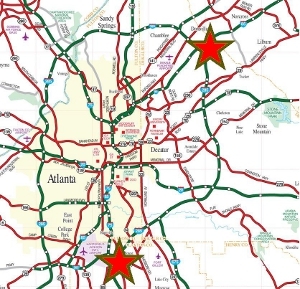 Our North store is conveniently located right near Spaghetti Junction (285 & 85N). Check out our heated and air conditioned indoor firing range, gun shop and safe showroom including Fort Knox Vaults and Champion Safes. We are about 7 miles from the Atlanta Airport off I75, near the Farmer’s Market. This is where our tradition of providing the South’s finest firearms, range and discounted safes began. Visit our air conditioned and heated range and monster safe showroom.